Reprint from Proceedings of SIBGRAPI'99 , 65-71. Copyright © 1999, IEEE Computer Press. Abstract. 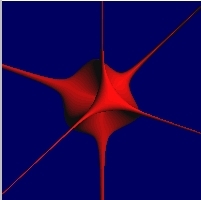 We study the performance of affine arithmetic as a replacement for interval arithmetic in interval methods for ray casting implicit surfaces. 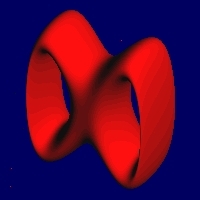 Affine arithmetic is a variant of interval arithmetic designed to handle the dependency problem, and which has improved several interval algorithms in computer graphics. J. L. D. Comba and J. Stolfi. 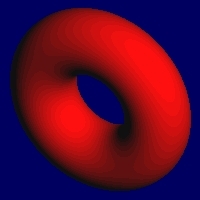 Affine arithmetic and its applications to computer graphics. Proceedings of SIBGRAPI'93, pages 9-18, October 1993. L. H. de Figueiredo. 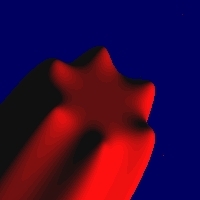 Surface intersection using affine arithmetic. In Proceedings of Graphics Interface'96, pages 168-175, May 1996. L. H. de Figueiredo and J. Stolfi. 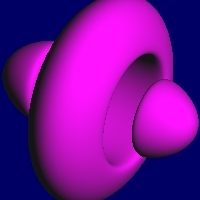 Adaptive enumeration of implicit surfaces with affine arithmetic. Computer Graphics Forum, 15(5):287-296, 1996. W. Heidrich and H.-P. Seidel. 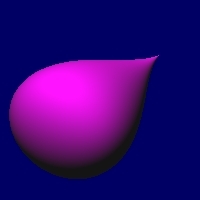 Ray-tracing procedural displacement shaders. In Proceedings of Graphics Interface'98, pages 8-16, June 1998. W. Heidrich, P. Slusallik, and H.-P. Seidel. 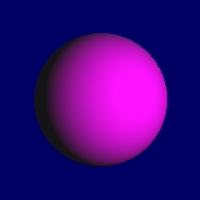 Sampling procedural shaders using affine arithmetic. ACM Transactions on Graphics, 17(3):158-176, 1998. D. Herbison-Evans. Solving quartics and cubics for graphics. In A. Paeth, editor, Graphics Gems V, pages 3-15. Academic Press, 1995. R. Ierusalimschy, L. H. de Figueiredo, and W. Celes. Lua: an extensible extension language. Software: Practice & Experience, 26(6):635-652, 1996. J. Stolfi and L. H. de Figueiredo. Self-Validated Numerical Methods and Applications. Monograph for 21st Brazilian Mathematics Colloquium, IMPA, Rio de Janeiro, 1997. Last update: Thu Oct 27 15:38:42 BRST 2011 by lhf.